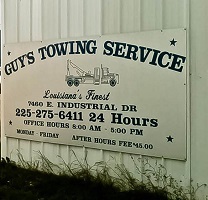 Want a top-quality tow truck in Baton Rouge? Having to call a towing company is hardly a fun experience. Many dispatchers are curt and rude, almost like they’re irritated that a customer is inconveniencing them. Wouldn’t it be nice if someone out there was different? 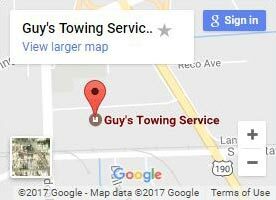 That company is Guy’s Towing Service. Whenever you need any kind of towing service in Baton Rouge, our professionals will quickly answer your call and give you the courtesy and respect you deserve. Then they’ll send a truck out there to help take care of you and your vehicle with minimal wait times. How fast will you be here after my call? While some companies claim to be there within a definitive timeframe without knowing your situation, it’s often a deceitful tactic. They figure that you’ll have invested enough time waiting for them that you can hold out for a few more minutes. We use a different strategy; honesty. We won’t give you an estimated arrival time until after you give us your location and details. Our time will reflect everything, and as soon as we determine the right truck to send, we’ll be right over! Need a heavy duty tow truck? We have those too! If you have a large commercial or industrial vehicle, a standard light duty tow truck can’t handle the job. That’s why we also have medium and heavy-duty tow trucks, to take care of even the toughest of jobs. Using our 60-ton crane system, our recovery service can even extract a vehicle from the water! This durable system is capable of free-lifting typical cars and trucks and setting them back on the street. Then we can tow it back to your property with ease! A tipped semi is very difficult to recover, especially if it’s carrying a full load. Even a heavy duty crane system alone could have trouble. That’s why we combine it with an airbag recovery system, to protect the vehicle and everyone around it. If your cargo hauler isn’t in running condition after an accident, we’ll help get it where it needs to be. We’re able to to do load shifts onto one of our Peterbilt trucks and then do specialized hauling for you so your cargo can make it to its destination. 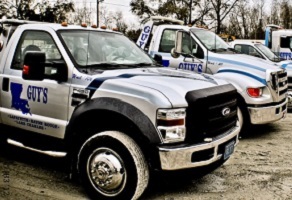 Because you can need us at any time, our towing and recovery services are always available. Having a 24-hour tow truck available means you don’t have to worry about finding someone that can help you. This goes for roadside assistance as well! 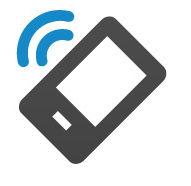 Our goal is to minimize this inconvenient experience as much as possible for you. This means that you can call us at midnight and we’ll still answer with the same friendliness as if you called in the middle of the business day. 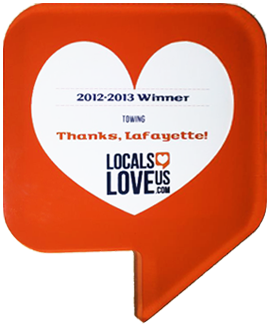 So give us a call or contact us today whenever you need a tow truck in Baton Rouge! At anytime, call our team for a tow truck. The team will take down your information and send a truck out. We’ll hook up your car and then take it back to your property and drop it off.